We return now to wind-swept Georgia and the tale of the most famous southern belle of all time, Scarlett O'Hara Wilkes Kennedy Butler. We've lost a few Best Shot participants this time around (people don't love Part 2 as much I guess - a group which includes me) or they're just running late (which includes me). I'm still debating between a few images and too tired to think any more. I'll decide tomorrow. Tomorrow is another day! The marriage of Scarlett and Rhett is its own version of Sherman's march... a path of destruction in their wake. There is something you love better than me, though you may not know it. No use trying to sweet talk me. I knows you since I put the first diapers on you. You're a heartless creature. But that's part of your charm. Scarlett stands confidently and defiantly. Its the only way she knows how. And that is... the end! Except for my choice. Unless a few stragglers show up. Hope you enjoyed. Next Tuesday night, September 2nd, our Season Five Finale: THE MATRIX (1999) for Keanu Reeve's 50th Birthday. Why not pick a shot and join us? My mom is obsessed with Gone With the Wind. My name is Kate but (more tellingly) my sister's name is Tara. My childhood home is basically a "best shot" gallery because it is decorated with dozens of commemorative Gone with the Wind plates, which capture different scenes from the movie. My favorite plate would always depend on how I was feeling that day, so these images are way too burned into my consciousness (and associated with random scattered memories of growing up in southern...California) for me to approach them rationally. I sent my mom the article for part 1 and she loved it: especially the Melanie/Scarlet relationship. She says that when she was growing up (1950s) Melanie was a far more popular character and lots of little girls were named after her. Now she's largely forgotten in the massive shadow of Scarlet. We're looking forward to your thoughts on part 2!! The second half has it's own allure but is missing the great sweeping images of the first so it was a bit tougher to pick a best shot. Mine is more contextual than visual. Scarlett, Melanie and Mammy are standing on Tara's porch just after Frank Kennedy has finally asked for Suellen's hand and they see another bedraggled soldier coming down the road. Scarlett says she hopes he won't be hungry, Mammy says he will and Melanie prepares to get another plate when suddenly she clutches her throat. Scarlett grabs her wrist and a look of deep concern spreads across her face. Then Melanie breaks free and runs to Ashley, who is the soldier on the path. It's a small moment but why I love the shot is because it shows that despite Scarlett's repeated indifference to Melanie there is always that underlying level of feeling for her that perhaps Scarlett doesn't even realizes exists in that most complicated relationship. I'm one of those late participants, and agree that there were less shots to choose from this time. I made a bit of a left field choice, but it's because I'm Team Melanie all the way: http://lamchopchop.blogspot.com/2014/08/gone-with-wind-part-2.html. 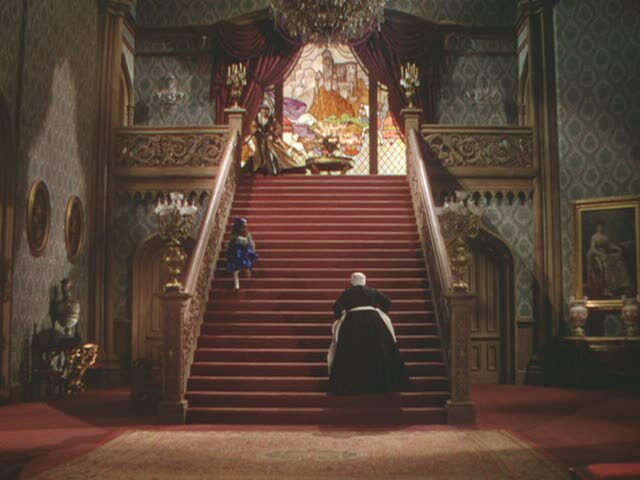 Interesting where most participants gravitated, although no one went for any of the iconic staircase shots in the second half with Rhett, Scarlett, Mammy and/or Bonnie Blue, like this one: Three Generations. My favorite thing about the second half is that it contains some of the finest work of Gable's career. I technically don't love Part 2 as much as Part 1 either, but man do I love it anyway. This was my favourite movie growing up (I was that kind of child..). Still pretty high on my all time list. joel6 - That is a great scene. The way the joy spreads over Melanie's face as she realises it's Ashley is one of Olivia De Havilland's finest moments in the film. Also, the way Hattie McDaniel says 'He's her husband ain't he,' after stopping Scarlett running after Melanie, sends shivers up my spine every time. As Part II goes on and keeps stuffing plot twists in, I think it loses some of its emotional pull (aside from the slow-motion car crash of the Butler's marriage--a uniquely unvarnished portrayal of bitterness, recrimination, and unhappiness). However, if I need a tearjerker moment, I can always go to Mammy's monologue as a witness to the unhappiness, and her praying on her knees--after her being one of the only characters in 3 3/4 hours who never, ever broke, seeing her fall to pieces is devastating. But then there's Melanie's death, and DeHavilland's heart-ripping sweetness and sincerity when she describes Rhett: "Be kind to him...he loves you so." Melanie may not have ever been able to really see Scarlett for who she was, but she absolutely nails Rhett. Some nice selections, as always, though it's always really weird when multiple people pick the same exact shot. Are they just pulling things off google image search or what? I suppose the second half isn't as dynamic as the first visually, but all those shadowy scenes late in the film are pretty striking, as I remember. Haven't seen the movie in a long time, though. Roark -- i think in this case, that scene is so famous and impossible to forget that why wouldn't peopel pick it? it's so dramatic and she's so beautiful. I also thought the staircase would be a no brainer for a pick, especially where they fight and Scarlett falls. Part 2 loses a bit because they glossed over a great deal of the social crimes Scarlett committed which are gone into in more detail on page. Courting while in mourning, working publicly, going out in public while pregnant not to mention driving her own carriage and working while pregnant. They touch on them, but you don't get the same sense of what people thought of her. In the book, these add another layer to the red dress scene as she was already pretty much an outcast and just kept giving them all more and more reasons to hate her and more and more reasons for her to avoid being in their midst. I always felt Scarlett and Melanie were two sides of the same coin. Scarlett was Mitchell as she wanted to be and be known. Defiant, strong, willful, ambitious, smart.....the savior and protector of herself and her loved ones even if it meant getting her hands dirty and Melanie was the woman Mitchell felt much of her family and society wanted her to be. Compliant, the good little wife, seen but not heard. That was why they were always in close physical proximity, had a strong protective streak towards each other, were each others equal in strength and intellect and were always in each others head through the entire book/film. Part 1 is definitely better than Part 2. The first half lets you luxuriate in the visual grandeur of the picture, while the easy pacing masterfully and playfully draws you into the story. The second half feels a bit more rough. They start throwing a lot at you at once: there's one big event after another, much too quickly, with little room for the viewer to breathe. But the buildup toward the finale--Fleming and the other three or four directors got it so right. It's hard to argue that image of Scarlett in the red dress as best shot: that always takes my breath away. Vivien Leigh's performance has to be the greatest ever. BTW, Cinemark will be playing Gone With the Wind in theaters as part of its classic series at the end of September. I've seen the remastered version in the theater, and there's nothing like it. I toyed with other shot possibilities but anything other than that shot of her in the burgundy velvet dress just felt like a lie or trying just to be different. that shot is one of my favorites in the entire film and I even had a postcard of it as a kid that I kept on my dresser...too iconic not to pick. I was also trying to find a good one of scarlett in her dress made of curtains but there's just no good shots. I also love the shot of her at Tara in another red dress as she sits in her newly acquired finery among the dilapidated home - selling her soul in devil red. and I've always loved how tranquil and nostalgic her face is at the end, with tears streaming down as she remembers Tara and says, "Home."